I couldn’t be happier with Alicia Paley Home Interiors in every respect. I love my new living room, hallway and kitchen area. Alicia took the time to understand what I wanted and presented designs and choices that were well beyond my expectations. She used numerous creative elements of design that spoke to my lifestyle as an ultra runner and taste in modern design. She took a long boring hallway and made it come alive with memorabilia that I had and didn’t know what to do with. Alicia is a true professional and all of our communications were clear with no surprises later. I am so proud to enjoy and show off my new living space. I recommend Alicia without hesitation. We LOVE everything about our kitchen remodel! Thank you Alicia Paley! We LOVE everything about our kitchen remodel! 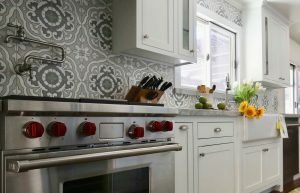 The open design is extremely functional, the colors lend a clean and earthy appearance, and the backsplash tiles represent our personalities to a tee! For those who are curious about her, she makes design decision-making easy. You tell her what interests you and what you envision, and she will know how to make your thoughts come alive. She is extremely knowledgeable, professional and well connected. Alicia’s connections are top notch from general contractors to sub-contractors to vendors for fabric, appliances, tiles, etc. She is quite the researcher providing us with 3-5 different options with different price points while matching the envisioned designs. If there is discussion about what to do, Alicia knows how to make sense out of any concern that arises and help finds resolve. She is very well organized and always prepared! 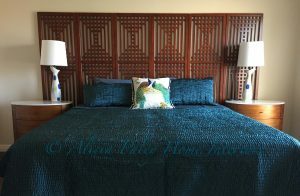 We highly recommend using Alicia Paley Home Interiors! We just finished a major renovation working with Alicia and although we are several hundred miles apart the communication was flawless. We worked to execute all of Alicia’s design ideas and the house looks fabulous. We have a very happy homeowner with a beautifully redesigned home in Las Vegas. Alicia was the consummate professional who not only had great design ideas but was easy to work with from day one. I am hoping she gets more clients in Vegas and would be excited to work with her on any project! It has been a pleasure working with Alicia Paley to create a beautiful, functional and peaceful living space in our home. 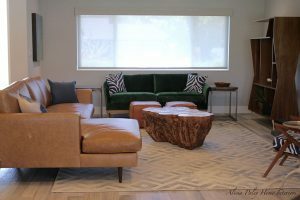 Alicia worked with my husband and I to design, furnish and accessorize our living room and entry. Having no previous experience working with an interior designer, we were put at ease by her gentle professional manner and her guidance through the process. She was organized and answered our emails promptly. She took the time to discover our tastes and preferences, along with the specific activities that we expected to enjoy in the room. She then used those preferences as a guide in sourcing furniture, accents and simple window treatments. It was made a little more difficult, because I knew what I wanted to create, but I didn’t know the terms of the profession needed to describe it. Alicia bridged that gap and was patient with me, making adjustments as we went along to assure that the end result was a space that we would love. And we do love it. The pieces she found, which are all lovely in their own right, are also interesting when they are arranged together along with some favorite items we already owned. At one point, it became clear that in order to find “that certain” table, it would have to be custom made. Alicia connected us with a local artisan woodworker who made us a simply perfect table out of beautifully grained hard wood, just as we had envisioned. Additionally, she guided us in fine-tuning adjacent rooms to pull it all together. We recommend Alicia Paley with no reservations, and plan to work with her again when we proceed to the next area of our home. I’m so excited to start implementing everything! Alicia was awesome. I’m so excited to start implementing everything! Alicia helped us transform and update our home. We had done a remodel of bathrooms and floors a year ago but hadn’t changed the furniture and the interior look. Even with the new bathrooms the house was looking very dreary and needed an overhaul. I LOVE how our home looks now. 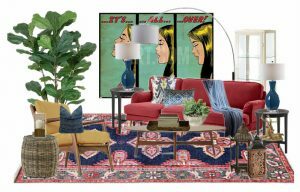 Alicia had great ideas and was willing to collaborate with us with our ideas for our living room and family room. Other decorators and contractors I had brought in to the house told us we needed to get rid of the mirrored wall in the living room which made the house look dated. Alicia helped us redesign the wall with panels to give it a contemporary look. It went from a wall that needed to be torn down to a wall that looks fabulous and is a focal point. Thank you Alicia, for all your time, effort and attention to all the design details. OMG! What a gem. Alicia was respectful, courteous, responsive, and has excellent customer service skills. Alicia responded to all of our requests and many times went above and beyond without even having to ask her. In a day and age when customer service seems to be a thing of the past Alicia is an oasis amid the customer service desert. We could not have found anyone better and her pricing is very fair for all the work she does for you. I will never have to look for a home interior specialist for all our future projects. Alicia is our choice! I can honestly say that she made our dream kitchen/family room come true. After spending a lot of money on paint samples and getting frustrated, I hired Alicia Paley for a color consultation to give me ideas on what exterior paint colors suited the style of my home. When she arrived to our consultation, I was very pleased that she already had done her research online and knew the style of my house before we even met. She also drove around my neighborhood trying to get a feel for the other properties around me. Alicia was very knowledgeable about colors and interior/exterior design. I found her to be very professional. After talking with me, and looking over my property, she carefully reviewed color samples from many different brands, and presented me with a choice of three color palettes. I was very pleased with her selections. Alicia has also been so helpful even after our consultation by allowing me to ask her some more color questions regarding my project. I am very thankful that I found Alicia Paley and look forward to working with her again with future projects. I asked Alicia to give me advice on a small (5×8) bathroom remodel and a future kitchen remodel. She confirmed my design ideas and made suggestions that were workable and I hadn’t thought of but were great design ideas. She was knowledgeable and very open to my ideas and then added on her own recommendations. She has the knowledge and can give ideas on current costs. It was like having your girlfriend review your ideas and plans, except she really knows what she’s talking about and your girlfriend is just that. Great experience. I highly recommend Alicia, our time together was well worth it. Alicia is a truly talented professional and a joy to work with. She has a wonderful eye for color, design, and layout. She is transforming our mess of a house into a home we can be proud of. 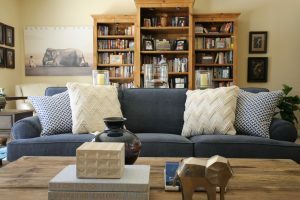 She had several design challenges to overcome in our house, including some had-to-keep things that looked to me like they could never coexist peacefully in the same space, but she has been able to bring everything together beautifully. Our living room and kitchen area now looks warm, inviting, interesting, and tranquil where before it was an eye-jarring disaster. I can’t wait to see what the rest of the house looks like after she’s worked her magic! I highly recommend Alicia Paley for any interior design project. Working with Alicia Paley was such a pleasure! 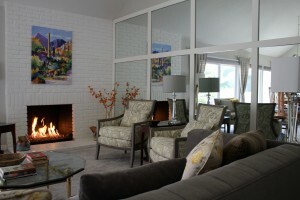 She is knowledgeable of both current trends and classic design and has a keen eye for color. I wanted to do some remodeling in our home but wasn’t quite sure of where to begin. 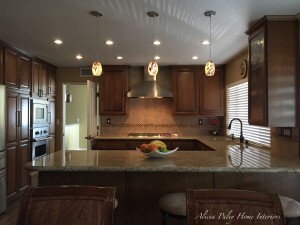 Alicia was able to create a design plan that included a kitchen remodel, a beautiful new color palette, great lighting ideas, window treatments, and the rearrangement of some existing furniture. We stayed within our budget and finished the project on schedule. I couldn’t be happier with the results and look forward to working with her again! It’s like you read my mind and gave me exactly what I wanted. You’re a genius. It’s like you read my mind and gave me exactly what I wanted. She listened and delivered the concept I wanted. Her presentation of ideas were all based on great communication and common understanding between us. I also felt her warm personality. Thank you Alicia. I thoroughly enjoyed working with Alicia. This was my first experience working with a designer and at first I questioned some of her choices but I quickly learned to trust her. I loved everything she picked out. She helped design my kitchen, family room, dining room and sitting room. She picked colors, woods and fabrics that I would have never picked and I love them. She was very professional and I can’t wait for her to help me with other rooms in my house. I had a paint emergency remodeling my master bath. I called Alicia Paley Home Interiors advertised on Houzz. She came out and within 1 hour picked a color that I love and looks great with granite and stone work. I highly recommend her. She is very professional and knows what she is doing. I’m looking forward to working with her in the future. Alicia had great ideas, current styles and kept my family’s needs in mind. I couldn’t be more pleased with Alicia Paley! She is easy to work with, extremely creative and is well versed with different styles of décor. Alicia carefully listened to my concerns and promptly organized my ideas for my home by recognizing my family’s personality. I hired her because I needed a different eye to help create a more functional bedroom for my daughter. 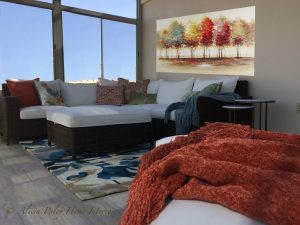 She was able to present options incorporating color, furniture arrangement and wall décor while keeping within a budget. Her floor plans were all accurately measured and beautifully hand drawn in color allowing me to visualize what the room would look like. I highly recommend her and will continue to use her for future projects! Loved loved working with you! Alicia Paley has an amazing eye for color! Alicia Paley has an amazing eye for color! She can quickly come up with several design ideas around just a few details. She helped me design our main bathroom and all I had was a vanity that I needed to work around. Her ideas were fresh and the paint color and flooring she suggested all work together really well with the vanity. She also gave me newer options for mirrors/medicine cabinets. I love our new bathroom! Alicia is very astute when it comes to understanding her client. Her knowledge of design and finish is superb when creating a space for clients. Her resourcing abilities are excellent and efficient. I enjoy working with Alicia and put great faith in her ability to deliver the style, look and space the client has envisioned. Great professionalism and beautiful taste make for a winning combination! Great professionalism and beautiful taste make for a winning combination! Smart, polite, and extremely conscientious makes working with Alicia a joy on each and every project!